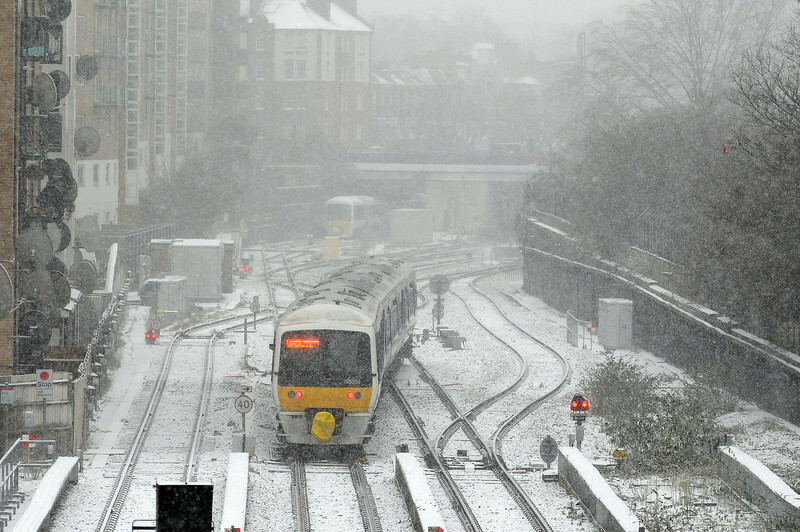 The 18th January brought the first significant snowfall of the year to Southern Britain. I was in Central London on Friday and managed a few pictures as I travelled from St Johns Wood back to North London. On Saturday morning I went out to Manea getting a couple of pictures in the rather gloomy light. More snow fell on Sunday 20th which rendered Monday's journey to work somewhat fraught as Network Rail and Southern somehow contrived to miss the forecasts and seemingly took no precautions, resulting in chaotic scenes at London Bridge, East Croydon and Three Bridges. Not a great start to the week. By Friday a thaw had started which accelerated dramatically overnight and by Saturday afternoon the snow was all but gone. An appointment in St John's Wood offered me an opportunity of this shot of a Chiltern 165 arriving in Marylebone in this morning's long awaited snow storm.